Welcome to our fundraiser! We’ve all had dreams about coming together to open an art space. 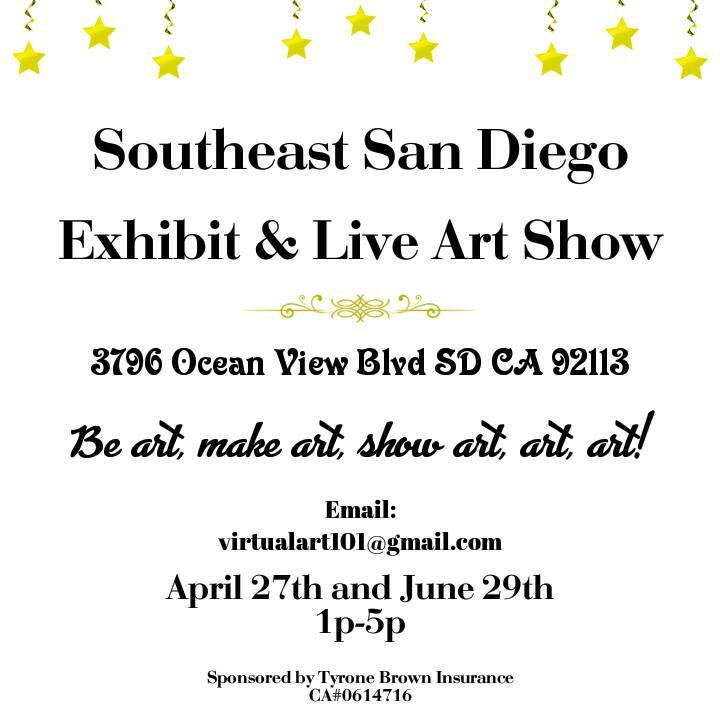 It feels like now the more events and projects we participate in individually and as a team, the more the necessity grows for an indoor artist location in Southeast San Diego, specifically in the Diamond District and surrounding communities where we all grew up. The Southeast Artist Collective and Gallery would be the premier location for art exhibits including sculptures, workshops on textiles, community classes on how to blend color and artist development. We have a huge competitive advantage in our community because there simply aren’t many artistic outlets in the immediate area. For local artists, this location would serve as a hub for healing arts and creativity. For residents, this location would serve as an opportunity to get involved in artistic activities and to unlock creative potential. Traveling exhibits and a collection of artifacts from around the world specifically Africa would bring a new life to our area. Sponsorship and monthly memberships would give our neighbors access to the arts for free or at a low monthly cost. Creative arts have been taken out of the schools and we don’t want our future generations missing out on the opportunity to discover their potential at a young age. Our team has committed to working at the space and providing a variety of artistic lessons to our community. The funds raised on this platform will be used to cover start-up costs at a potential location on Euclid Avenue including the monthly lease amount of $2,000, an LLC, insurance, paint supplies, furniture and advertising. The space is beautiful with high ceilings and wide walls which will be perfect for permanent and temporary art displays. There is an open area as well as individual offices within the space, perfect for our local artists to hone in on new talents, focus on large projects and build their ability. The building comes with incredible amenities like a kitchenette, central air, restrooms, janitorial service and a parking lot. In order to cover overhead costs, our financial plan includes sub-letting as well as collecting fees from art sales, events such as youth and adult paint parties and workshops. By year 3, we’re set to triple our profits from the various activities including as mural installations throughout the city. The support from our community would mean everything to the art team because we hold several events and art workshops by renting out different venues. Donors have the power to change that. Your support would provide us with a permanent home. We would be grateful for any contributions. Each donor will receive a token of our appreciation. Our future generations will be covered for years when it comes to having access to creative projects and the arts. We want to eventually purchase a building and create a snowball effect from there of continuing to acquire property on a community level including grocery stores, laundry mats, resource centers, a center for technology and coding for our youth and housing. The goal is a collaborative effort between the art team and the San Diego Community Investment Fund. We want to assist in uplifting and empowering our neighborhood by recycling our dollars and creating jobs. Investment opportunities available at a later date through a buying club. Finally, with your contributions, we all leave an outstanding legacy for our children, grandchildren and great-grandchildren. By coming together today, we’ll be handing our future generations the keys to tomorrow.